Donations - Play a Leading Role! When you support The Lyric Theatre, you play a leading role! Ticket sales cover less than one-half of The Lyrics's artist fees, production costs and operating expenses. 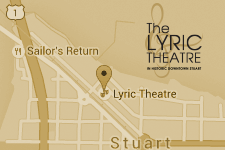 The Lyric Theatre / Friends of the Lyric, Inc. is a 501(c)3 organization registered in the State of Florida. No goods or services may be provided in connection with your contribution. A COPY OF THE OFFICIAL REGISTRATION (CH1579) AND FINANCIAL INFORMATION MAY BE OBTAINED FROM THE DIVISION OF CONSUMER SERVICES BY CALLING TOLL-FREE (800-435-7352) WITHIN THE STATE. REGISTRATION DOES NOT IMPLY ENDORSEMENT, APPROVAL, OR RECOMMENDATION OF THE STATE.